Carnoustie’s Fall 2016 zippered jacket is as comfy as outwear can get. For the past two decades, California-based Carnoustie Sportswear has been turning out some of the most comfortable, high-performance clothing in the market – – golf shirts that wick away moisture, slacks and shorts that are functional and fashionable, and wind jackets as warm and comfortable as a favorite old Tahoe fleece. In a trend contrary to the garishly wild colors that crept into men’s golf-wear some five years ago – – including a few screaming-neon greens and cringe-worthy oranges that still sit in unopened bags in my closet – – Carnoustie’s Fall 16 lineup featured a fair number of subdued patterns. For example, consider its shade of gray golf shirt in the company’s Tech line, with moisture management, anti-microbial properties and 50-plus-protection against ultraviolet rays, with a cut that will hang comfortably on even the larger frames. And then there’s a plain black zippered wind-shirt that doubles as a lightweight jacket, soft and yet weather repellent. Carnoustie also debuted a partnership with a company called Aristo Eighteen, which weaves its own fabric and makes worsted wool trousers, five-pocket jeans and shorts. In addition, for the first time it offered a line of belts, a collection under the brand “Carnoustie by Nexbelt,” an upscale collection of tumbled leather, contrast stitching and featuring a Carnoustie Icon buckle. Now, for the Spring of 2017, Carnoustie is releasing a relatively muted “color block” style, with simple lines and patterns. “We introduced a beautiful mélange solid for Fall 2016,” said Carnoustie CEO Marshall Mancillas, “and for Spring 17 we’ve developed new colors appropriate for the season – – such as amethyst, melon, spearmint and sky.” Like all of the company’s performance styles, the fabrics include moisture management properties, odor management and UV protection. The block patterns and colors of the spring collection are casual and cool. The company also has several waterproof styles, with taped seams. “These styles present an alternative to the heavier, often-drab styles in the marketplace, which are designed for the gale force winds and rain found at the Open Championship,” explained Mancillas. The firm’s waterproof styles are light-weight and sport colors that pair well with regular shirts and slacks. 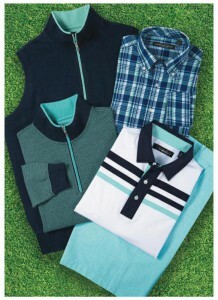 Founded 20 years ago, Carnoustie Sportswear has become a recognized maker of some of the finest golf apparel available. Fine fabrications, outstanding workmanship, and timeless, elegant styling combine to create an exceptional collection of sportswear. Carnoustie is carried in some of America’s most exclusive golf resorts, private country clubs and retailers. For product details, visit www.carnoustiesportswear.com.